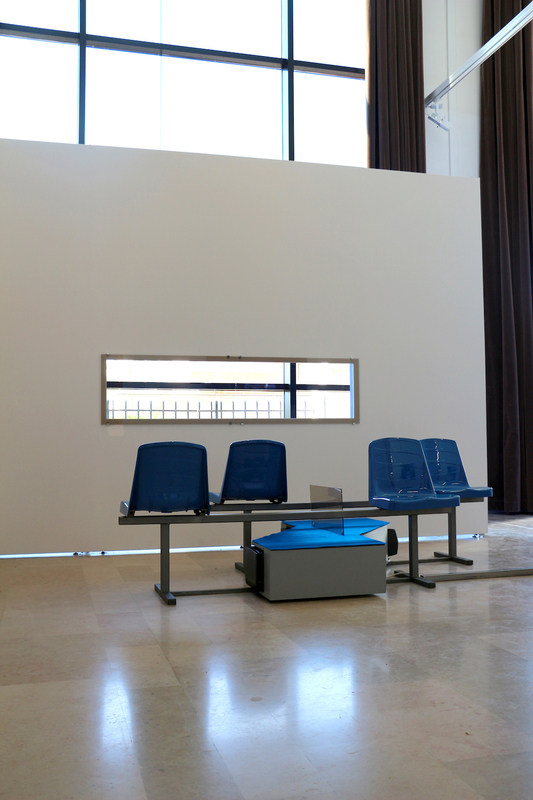 Through her acoustic and deliberately polyphonic installations, Anne Le Troter explores the mechanisms of language. Nurtured by everyday experiences, and poets such as Christophe Tarkos, Charles Pennequin and Nathalie Quintane, her praxis has developed out of the recording and editing of collected words. The orality and role-playing which she introduces become the vehicles for an observation of the world which is tending more and more to take the form of a total work conveying her fascination for theatrical representation. Somewhere between décor and set, she constructs territories for these bodyless voices which are developed in space. For her exhibition “Bulleted List” at the Palais de Tokyo, we go back with her over her pathway through language. At what moment did your praxis veer towards language and words? I was studying at the School of Art and Design in Saint-Etienne, where I was developing a sculptural praxis, until the school acquired an audio recorder. By using that tool, I became aware of editing, which in turn enabled me to produce a form of acoustic sculpture based on my own voice. The piece Fifi, Riri, Loulou (2011), inspired by Robert Fillou’s “Autrisme” [literally: “Otherism”]:“Whatever you’re thinking, think something else; whatever you’re doing, do something else”, was a major step in my activity: onto the recording of a series of improvisations I cut silences between the words, creating a speeded-up pace suggesting a thought in the process of being formulated. Was audio editing a chance to deal with issues related to time? Yes, it was from then on that I started to develop an interest in the time-frame of a sentence. What’s more, I started to raise that question, more out of curiosity, among the people I was working with: “By admitting that you get up at eight in the morning and go to bed at eleven at night, during a day with a normal rhythm (work, going out, etc. ), if you had to put end-to-end all the sentences you’d uttered, and if you removed all the silences, in your opinion how much time each day, on average, do you spend talking?” The interviewee will make an initial mental editing by thinking about that question, activating an inner voice which remains inaccessible to me. Can we already regard that as sound? At the same time you were also exploring spoken language through publishing. Anne Le Troter, L’appétence, 2016. Sound: 9’22. Salon de Montrouge. In collaboration with ASMR artists: Final ASMR, Made In France ASMR, Miel ASMR, Mr Discrait, Sandra Relaxation ASMR, The French Whisperer. I was then at the Geneva School of Art and Design (HEAD), where I took part in Hervé Laurent’s writing workshop. I asked him to read my texts and he offered me to publish L’Encyclopédie de la matière (2013) with Héros-Limite editions in collaboration with the HEAD. What was involved was the script for a much larger work of logical deductions from thinking based on recorded improvisations. In it I broached issues connected with matter (sound, video, sculptural) the better to get back into the text. I also wrote Claire, Anne, Laurence (2012), a play presenting the codes and structures of language which I had developed with my sisters. We find this idea of coded language again through the people you work with, who belong to professions and trades which use a very specific vocabulary. How did you shift from a work focusing on your own words to a more collaborative form? It was after losing my voice that I had the idea of bringing in people from outside, and recording them as part of various projects. So I invited a group of telephone pollsters to work with me with a view to putting on an exhibition at the BF 15 in Lyon (“Les Mitoyennes”, 2015). I subsequently worked with ASMR artists (autonomous sensory meridian response) who were involved in a relaxation technique using the voice (L’Appétence, 2016), and with some dental prosthesis makers for the show “De l’interprétariat” at the Arnaud Deschin Galerie (2016). What form does this group work take? Starting with Les Mitoyennes, I set up a procedure consisting in conducting an interview with the various people contacted, with a view to forming a working group and seeing if we could agree about the way of doing things. After that initial exchange there was the recording phase which would give rise to the final sound piece. That stage is decisive because it’s based on the accumulated matter that I’ll be able to give a more precise direction to the project. In the end, I handle the time I’ve been given, the time taken up by the words to be exchanged. It’s like re-seeing the present. 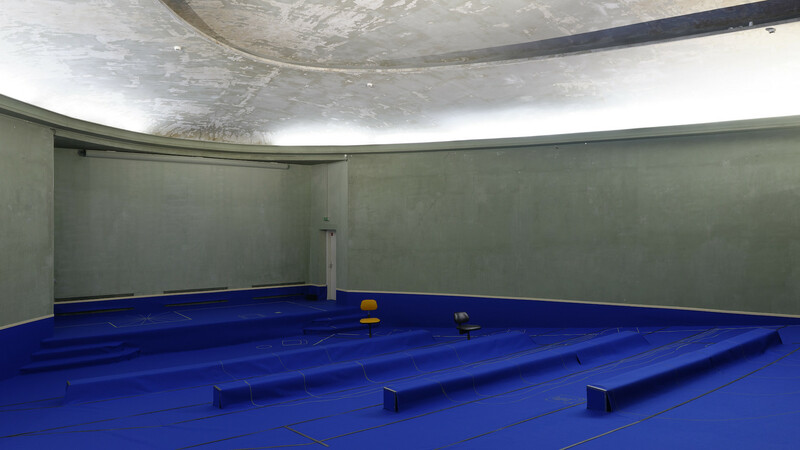 After the Salon de Montrouge Prize which you won in 2016 for L’Appétence, you presented a new acoustic installation at the Palais de Tokyo titled Liste à puces. What was the origin of that? Anne Le Troter, Les mitoyennes, 2015. Sound: 13’. Audio engineer : Max Bruckert. La BF15, Lyon, with the support of Pro Helvetia, in partnership with Grame, centre national de création musicale ; MAC Lyon. Photo: Jules Roeser. Liste à puces is directly linked with Les Mitoyennes, which was presented in 2015 at the BF 15. It’s in a way its act II, and its format is somewhere between the exhibition and the representation. In that instance I was interested in political polls in view of the current electoral context. I worked with the Lyon group with whom I’d been in contact for the show at the BF 15, and another one in Paris, with which we’d thought about strategies aimed at blurring the source of the words, by repeating with five voices the most problematic linguistic elements for their work stations. I also went to the polling institute to listen to pollsters at work. Sitting at my station, I could move from one to the other, and compose in zapping mode, while at the same time capturing the inter-spaces of language which develop during the work period: the discussions between two questionnaires but also at times signs of weariness. I subsequently had access to archives of this type of recording sent by the call centre, with the authorization, needless to add, of the pollsters. How did you edit the piece based on the work done with those different groups? 3-questions to do with the notion of items. Political questionnaires are always identical. Of course, names, dates and places change, but the structures of the sentences remain the same. So I asked the pollsters to cross out the content and keep just the container, while still respecting the time taken for the standard sentence or question by stretching out certain syllables before and after the script. For example, with the question: “What political party are you closest to, or let’s say least distant from?”, they had to hold the word “what” for the time it would take to say “political party are you…”. In the end, the pollsters are in their turn polled about the items they propose and the need to reduce or increase them, because lots of people have trouble giving precise answers. 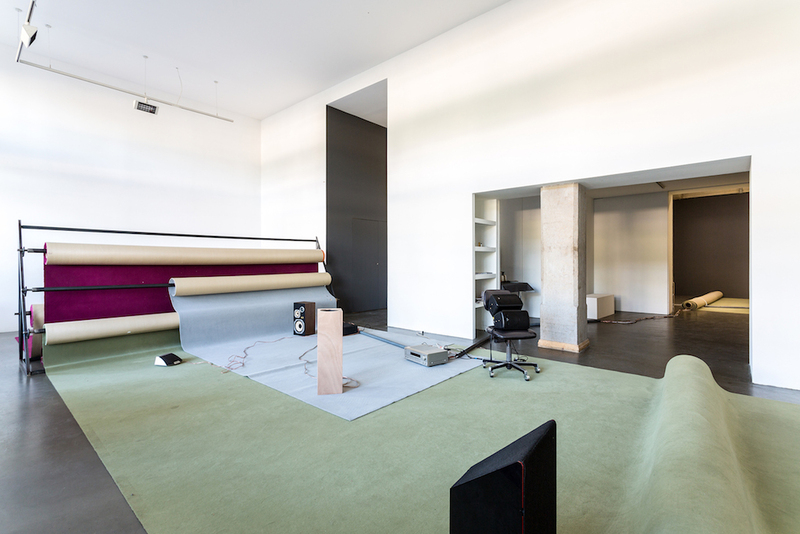 Your pieces are usually developed within installations which convey a somewhat administrative aesthetic, a plastic vocabulary made up of office chairs, bits of carpet, and sound broadcasting apparatus. What place do you earmark for this more visual aspect? Anne Le Troter, De l’interprétariat, 2016. Sound: 15’. Courtesy Arnaud Deschin Galerie. Photo : Romain Darnaud. Obviously the installation represents an important part of the work, but it wouldn’t exist without the sound piece. Above all, it focuses on language and listening. At the BF 15, I played on the history of the place, an old carpet shop, by using that material for its acoustic properties and its comfort (I’m incidentally quite sure that listening passes through the feet), but also because it enabled me to define language projection zones, a space within the space. It’s a matter of giving words a territory and a body. This is also why I usually leave the sources of broadcasting visible. 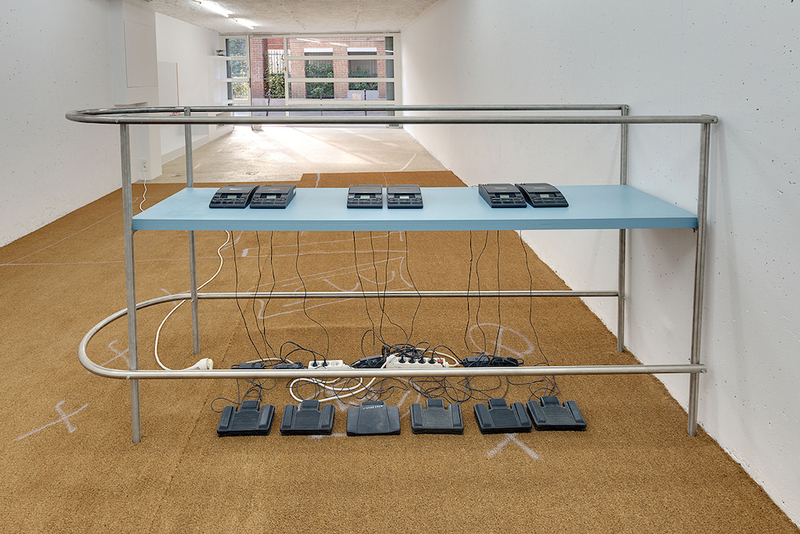 For technical reasons, the speakers in Liste à puces are hidden in boxes which give material form to the alignment of the pollsters’ work stations. On the carpet I transferred the plan of a polling institute and the positions of the different people involved (each one corresponding to a speaker), accompanied by a statistical portrait. Overlaid on this visual grid is the sound grid in which I assigned a place for words used by making use of the hierarchy of a questionnaire that is based on a left-to-right reading. It seems to me that you are here reversing the logic of the furniture music dear to Satie: it’s no longer the sound track which plays a utilitarian and harmonious role, but the visual elements which make it possible to focus the spectator’s attention on the voices. In fact I’m trying to set up environments which are as stable as possible, so as to let the words develop. I’m also trying to make a place for the spectator. Liste à puces is presented in an old cinema with a sloping floor. I’d noticed that when this space is used for a screening or performance, the public tends to stay on the threshold of the auditorium. I, on the other hand, wanted to offer the experience of a descent by drawing a horizon line at the level of the visitors’ feet. So when you enter, you plunge into a blue listening tank. The work’s visual and acoustic grid prompts visitors to head for the platform which becomes the preferred vanishing point to discover it. So they find themselves looking from the stage at the space where they usually stand. The installation enables me, quite simply, to introduce the conditions for listening to my work. And the fact that room 37 in the Palais de Tokyo is an old cinema auditorium seems to be especially meaningful in relation to your interest in listening sessions. I’m very keen on the session idea. When I went to the cinema as a child, sometimes I would miss the beginning of the film and then stay on for the following screening to see the missing part. Similarly, visitors rarely arrive at the beginning of the sound broadcast, and decide to listen to the whole thing or not. So at the Palais de Tokyo I set up a play of light, a new element in my work, which gives visitors a time reference, even if they arrive half way through. Each broadcast is incidentally interspersed with a long silence to emphasize the idea of a session. This determines the attention span given to a work. The collective listening situation I find especially interesting because it reveals a set of patterns of behaviour, a whole language of bodies and eyes between the spectators. These micro-actions, just like the mental paratext of visitors and pollsters (those words that are not uttered but which ring out in our heads when we think or write), swell the work. Do you imagine producing an act III with the telephone pollsters? I don’t know yet, but I’m thinking about another arrangement that would derive from this collaboration for the exhibition “Rendez-vous” at the Institute of Contemporary Art in Villeurbanne, next September. With a bit of hindsight, I realize that the different acoustic installations I’ve been producing work like a general rehearsal or an accumulation of décors for the play which I’ve long been idealizing.